Light snow fell, pushed about by an uncertain, swirling breeze. A button buck wandered downhill from the ridge, followed by a small doe. The scruffy doe looked straight at the toppled cedar tree, perked her ears and canted her head. A hearty snort seemed inevitable, but instead she walked due north, disappearing in the cedar tangle that guarded the upper trail. My wife and I lurked behind the cedar tree’s gray, needle-less branches. Tami watched the uphill trails; I sat cross-legged with a clear view of the lower paths. Two more whitetails came and went over the course of the next twenty minutes. Both glanced at our cedar fort, but neither detected danger. The shifting breeze died to a butterfly breath. Despite the cold that evening in late-November, in the Year of our Lord, 1792, grew quite pleasant. Sometime later an old turkey hen clucked on the ridge. I shifted my hips to the west and repositioned “Old Turkey Feathers” across my legs. I saw one bronze shape, then three, then more. Wild turkeys flooded over the ridge crest like battle-tested Hessian soldiers on a bayonet charge. At the same instant, swan-shot-sized snowballs began falling with a hushed, rumbling sound. Within sixty seconds we found ourselves prisoners; two dozen or so turkeys surrounded our lair, the closest not more than four trade gun lengths distant. The birds looked speckled from the clinging snowballs. Some walked in compact circles, never taking their eyes off our besieged fort. Two fat hens, the commanders, stood tall beyond the root-ball as they popped and clucked and putted orders. Then, as quick as they broke over the hill, big wings flapped and our captors flew up to roost. The snow squall ceased. Down the hill, upwind of the toppled cedar, we both saw creamy-white tines. When the tines dropped to the forest floor, Tami eased to her right, her thumb fidgeting with the hammer of her cut-down, chiefs-grade trade gun. The young buck crossed under a big, spreading red oak, then angled farther to the east. He nosed the ground. Tami shouldered the “Silver Cross” and cocked the hammer. I heard the sear click. “Grant her a clean kill, or a clean miss. Your will, O Lord,” I prayed. I saw her lips move. I smiled, thinking she offered the hunter’s prayer at the same time I did. Short tines rose upward. The buck turned broadside. My wife waited. We both heard the single, raspy “putt” behind us, but the buck seemed to give the warning no mind. The Silver Cross’ brass turtle sight moved about. The six-pointer looked to the south, then the north, but never at our humble cedar. He turned around, nuzzled the ground and walked back to the spreading oak. He stood for a good while, then loped away. 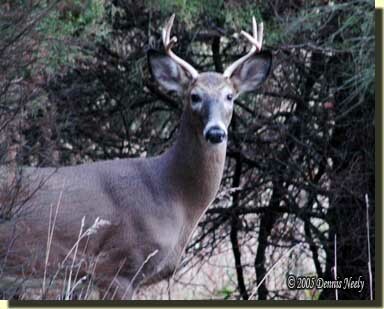 A few weeks ago a seasoned traditional black powder hunter brought up the subject of effective distance. He thought he understood the concept, but asked for clarification, anyway. At the end of the ensuing conversation, he suggested I might devote a blog post to discussing the importance of knowing one’s effective distance. The concept of effective distance is an ethical choice spawned by a deep respect for the wild game traditional hunters pursue. In any given woodland encounter, it is easy to pull the trigger and unleash the death sphere, but infinitely more difficult to weigh the circumstances and choose not to. Either choice is wrought with consequences, but in the latter, those consequences are easier to live with. As traditional black powder hunters, we each bear a responsibility to the game standing or flying in front of our collective turtle sights to execute the best, most humane shot possible, a shot with the highest probability of effecting a clean and quick kill. In a broader sense, we also must shoulder a similar sense of responsibility to our fellow hunters, both traditional and modern, by adhering to a high level of ethical conduct when afield. There are at least four factors that must be looked at to answer this question: one’s own personal ability, the capabilities of the gun, the load used and the terrain hunted. For the most part, these factors are pretty straight forward, but when combined they can become a bit tricky to unravel. On that November deer hunt, Tami entered the woods with an effective distance of 35 yards for her round ball load in the Silver Cross, as determined on the practice range. How did she arrive at the 35-yard limit, you ask? Tami set an allowable shot grouping for the game she intended to hunt—deer. She wanted to be able to place all her shots within an eight-inch circle, a choice consistent with accepted ethical hunting practices. To eliminate doubts about the Silver Cross’ capabilities, she asked an experienced shooter to test her load and the trade gun. Shot from a bench rest, the Silver Cross and the selected load grouped within six inches at 50 yards. Confident of the gun’s performance and the load, she started shooting off the bench at 25 yards. After a few practice sessions, Tami learned to hold the same sight picture, which tightened the groups within the eight-inch limitation. 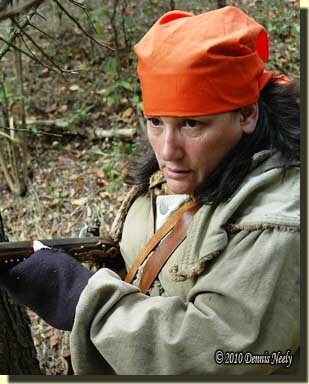 She switched to shooting from a sitting position, which she intended to use for the actual hunt. By opening day, Tami acquired a skill level that allowed her to place all of her shots within the eight-inch circle from 35 yards—her effective distance. The falling snow, swirling wind and visibility limited to 35 yards or less made the downed cedar a prime location. By the time the buck headed uphill, Tami knew her best, open shot was a tiny clearing at 32 yards—the true effective distance governed by the shot presented on that terrain. In essence, Tami hunted within her effective distance, minimizing the temptation to take a low probability shot filled with the potential for unpleasant consequences. And by sitting next to her, I accepted her limitations, thus allowing the terrain picked to reduce my effective distance. To date, we have not determined the ultimate capabilities of the Silver Cross, simply because we don’t need to, and won’t, until such time as Tami’s personal marksmanship pushes that issue. A similar situation exists with Old Turkey Feathers. Using a competition load with a patched round ball, my effective distance was 75 yards. But experimenting with natural materials for wadding and period-correct loading practices opened my round ball groups up. The change in load now becomes the limiting factor, reducing my effective distance to about 50 yards. At 85 yards, the competition load starts to “tail off,” going in whatever direction the wind pushes it, much like the late Hoyt Wilhelm’s knuckleball. Changing the powder charge affects the point where the wandering begins, but that is an unnecessary load adjustment, because my personal ability to maintain a consistent sight picture nullifies the distance gained. Turning to shot, the capabilities of a cylinder-bored barrel most often determine a traditional woodsman’s effective distance. On the surface, the choke-less bore is often cited as a cumbersome disadvantage, especially by modern hunters who convert to the traditional hunting philosophy. I’ve hunted with the same cylinder-bored Northwest gun for 35-plus years and don’t see it that way. But again, terrain selection is often the key to continued success. In reality, shot loads all but remove personal ability from the list of contributing factors. The capabilities of one barrel over another also prove minimal. The prime consideration becomes maximizing the efficiency of the powder-wad-shot column, which demands hours of time at the pattern board. I’ve come to the opinion that most traditional hunters overlook or ignore this crucial aspect of determining effective distance with respect to shooting shot. The common mindset seems to accept the 25-yard limit as standard, giving little thought to pattern density, shot size performance and adequate penetration. A number of years ago I helped a traditional hunter pattern his Tulle. He kept “missing” turkeys, and was sure the gun wasn’t shooting straight. He was using the “heavy turkey load” a friend recommended. He talked about “patterning” the gun once, at a commercial-size baked bean can. This poor fellow stood slack-jawed after the third shot printed on craft paper. All three patterns had a huge hole in the middle. An adjustment to the wad column solved the problem. When he started experimenting with shot sizes, I knew I had a convert, and before that practice session was over, he added four yards to his effective distance. Check out your effective distance, be safe and may God bless you. This entry was posted in Muzzleloaders and tagged Dennis Neely, historical trekking, North West trade gun, Northwest trade gun, trade gun, traditional black powder, traditional black powder hunting, traditional blackpowder, traditional blackpowder hunting. Bookmark the permalink. Thank you, Adam. Reader comments, questions and suggestions are a tremendous help to me when deciding on topics for the blog. Thanks, Jeff. Critter size does have an impact, whether you hunt squirrels with a small-caliber rifle or moose with a trade gun. In each case the acceptable shot grouping changes. And as you say, for larger animals your effective distance might increase by default, assuming the round ball still carries enough energy for a clean kill.